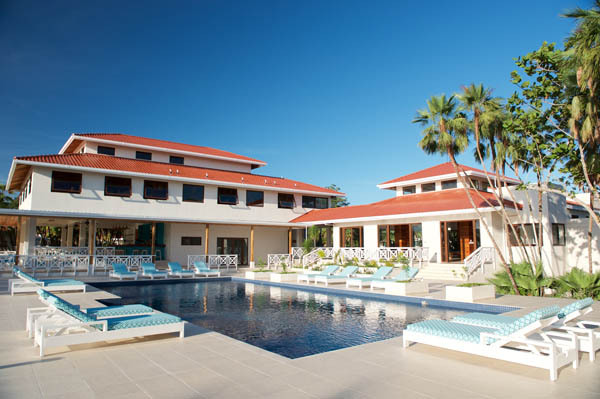 Hidden within a 200-acre reserve on the Placencia Peninsula, Naia Resort and Spa is a cozy and natural playground where guests can admire Belize’s beauty on land and in the waters. Known as one of the Caribbean’s most authentic and inviting destinations, the island’s calming waters and luscious rainforests makes it an ideal vacation getaway. Take a step into the lobby and the view of the estate catches your eye. No matter the time and day you arrive at Naia, it is a must to take a walk along its mile-long beach where the view of the palm trees blowing in the wind with waves crashing against the rocks simply blow you away. Situated along the palm-studded beach are 35 secluded beach houses each with a breathtaking view of the Caribbean. Naia’s studio beach houses completes the serene ambience that Naia exudes. 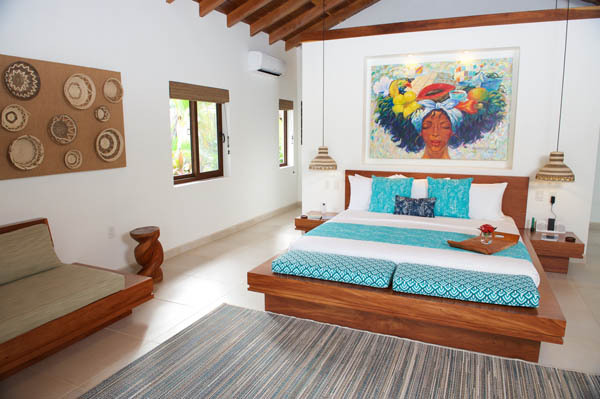 The cathedral hardwood ceilings along with walls decorated with paintings created by local and regional artists reflects the natural surroundings of Belize. After a busy day of trekking in the rainforests, unwind in the indoor tub with Naia’s signature Citrus Nectar Scent bath amenities or sip on a glass of wine while watching the sunset on the outdoor veranda. However, the standout amenity has to be its outdoor shower garden. Wash off the sand in your hair as you absorb the suns rays and appreciate the singing of the bird, it’s a truly magical experience. If you’ve done your research on Belize, you’d understand that the sunrise is not to be missed. Waking up at 6 during a vacation may seem like a drag but witnessing the sunrise across the sea is the highlight of the trip. Steps away from your beach house, feel free to sink your toes into the white sand and take in the breeze as you face the waters. To complete your trip in paradise, visit the spa for a divine experience. Nestled among the trees, you cross a bridge to heaven which accommodates five treatment rooms with a private island couple retreat. With a menu featuring massages, facials, couple’s rituals and body treatments, guests can expect an authentic, deep and powerful pampering session. 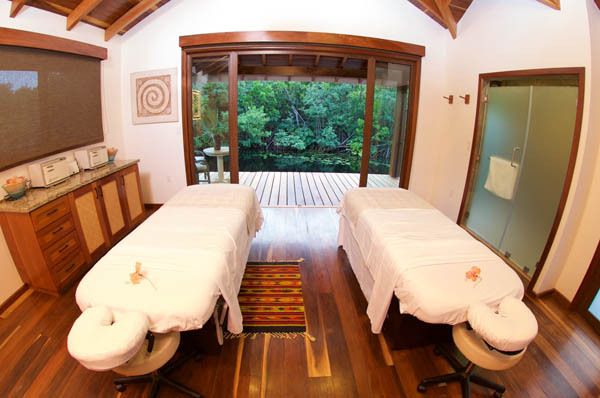 Celebrating the ecological and cultural diversity of Belize, the spa has a garden where herbs are grown, ensuring that the products used are natural and organic. Completing the pampering session, guests are welcomed to visit the private nail salon that offers manicure and pedicure using vegan nail polish. Naia does not simply utilize Belize’s natural resources but its human resources too. You would notice that staff of the hotel are Belizeans because Naia has remained adamant in hiring the natives in a bid to develop the country. Beyond the spa, guests will find the Reflections Spa Cafe is an ideal location to spend the lazy afternoon. Serving fresh, healthy and tasty snacks, its relaxed and casual atmosphere makes it easy to chat with friends and make new ones along the way. Featuring a variety of beverages on their menu, guests can sip on their drinks while admiring the sun set over the lily covered lagoons. 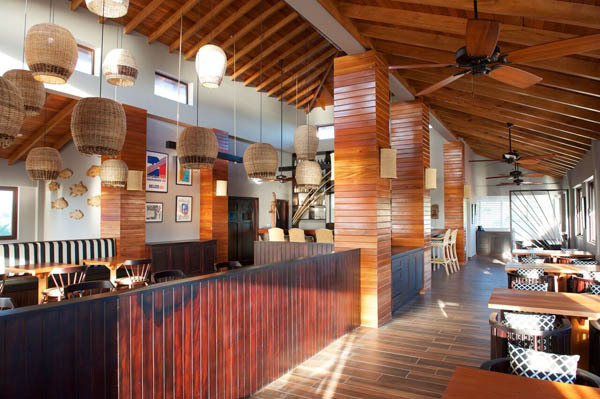 While there are plenty of hidden gems located around the island, the resort boosts an impressive list of restaurants. Located by the poolside, the Beach Bar and Grill is a good escape from the heat. Guests can grab a drink or a quick lunch between dips in the pool. Start off your day with a delicious omelette at the casual poolside restaurant and venture to 1981 to celebrate your vacation. Named after the year Belize obtained independence, the upscale restaurant is helmed by Executive Chef and F&B Director, Chef C. Andrés Meléndez G. With a rotating menu that features dishes such as grilled watermelon served with homemade barbecue chicken and slow cooked pork tenderloin topped with curried cauliflower puree, 1981 will leave guests craving for more. Cool off after sun tanning with a gelato at Tutti Frutti. Opening a branch at Naia, the famous Belizean gelato features a menu with dozens of options, leaving adults and kids craving for more. Just as any world class hotel, Naia has a fitness center. However, the standout is not its impressive amenities but the floor of the gym. Made of recycled Nike sneakers, it reflects Naia’s mission to reuse and recycle. Admire the serene view of the lagoon and its vibrant green vegetation while running on the treadmill. Yoga fanatics have to pay the picturesque yoga and movement studio a visit. The studio offers a variety of options including sunrise and sunset yoga classes, guided meditation, and yoga nidra and the trendy aerial yoga. Offering amenities such as a pool and spa, Naia also has kayaks and snorkels for guests to enjoy water activities right off its shore. The hotel also arranges snorkeling trips to the hemisphere’s longest barrier reef where the beauty of the corals and the sight of exotic sea creatures never fails to amaze.